Hip replacement surgery can change a person’s life. 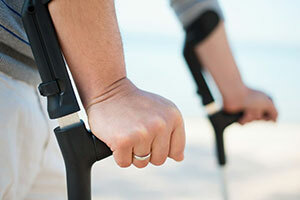 It can restore mobility and physical capability that he or she has not enjoyed in years. As patients, we expect that the necessary testing has been done to ensure that all the parts of the device work properly and perform as advertised. The Stryker Rejuvenate Hip Implant System was released in 2010 and is a modular hip system of femoral bodies and necks. Stryker claims this product “is designed with the potential to provide: (1) Enhanced Stability; (2) Proven Modularity and (3) Intraoperative Flexibility.” While the Stryker Rejuvenate Modular Hip System is not a metal-on-metal hip system there have been increasing reports of metal injuries at the location where the metal modular stem meets the metal neck of the device. The Rejuvenate stem bodies are made of TMZF alloy, a proprietary Stryker material with a plasma sprayed coating of commercially pure (CP) titanium and PureFix HA. The modular necks are made of CoCr alloy. Total hip replacement surgeries involve the replacement of both the head of the femur as well as the acetabulum (socket) of the pelvis. Stryker offers hip replacement products to address first time (primary) hip surgeries as well as revision systems. Babbitt & Johnson P.A. is investigating potential litigation involving the Stryker Rejuvenate Modular Primary Hip System, a comprehensive system of hip implants. In 2009 Stryker introduced the Rejuvenate Modular Primary Hip System. The Rejuvenate Modular Primary Hip System was touted as offering surgeons unparalleled options for personalizing the implant to each patient’s anatomy. The Rejuvenate System is designed to optimize anatomic restoration by providing options that offer enhanced stability, proven modularity an intraoperative flexibility. The modular design enables the surgeon to independently manage stem size, leg length and offset to recreate the patient’s anatomy, restore biomechanics and, consequently, minimize the risk of dislocation. Headquartered in Kalamazoo, Michigan, Stryker Corporation (SYK) is one of the world’s largest medical device companies operating in the global market. The Stryker Rejuvenate Hip Implant has not been recalled in the United States yet, but it seems to be doing a good bit of damage to those who were implanted with the new device. Babbitt & Johnson, P.A. is presently investigating cases involving the Stryker Orthopedics Rejuvenate Modular Hip System. Our Florida lawyers are currently reviewing potential Stryker Rejuvenate lawsuits throughout the United States. If you have pain from your hip implant, call us. Because many hip replacement patients are unaware of the type of implant used, cases are being investigated for any individuals who have experienced problems after a surgery since 2008. There are no fees or expenses unless a recovery is obtained. Call us today at (561) 684-2500.